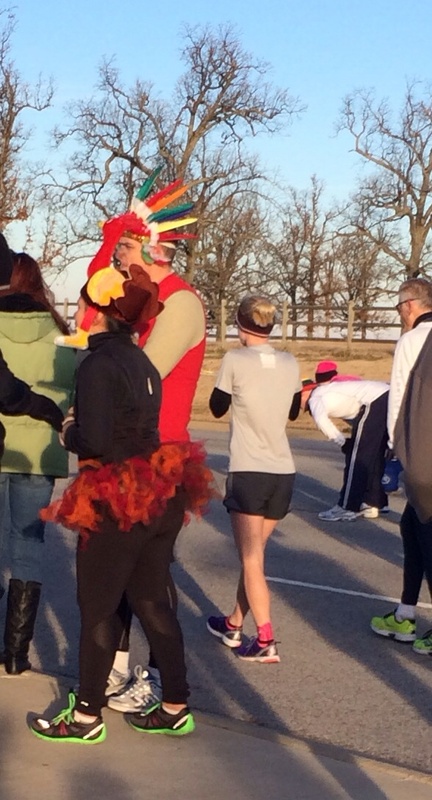 I was excited this year to head out for my very first turkey trot! I’ve always heard of people heading out for races on Thanksgiving morning, even “non-runners” and thought it seemed cool but couldn’t imagine myself as one of those people. Among other things, when you get up and get started cooking early, it’s hard to shift gears a couple of hours into to head into town to run a 5K! Now that we travel for Thanksgiving with a two year old, we stay in a hotel so we aren’t really there to help with early morning cooking anyway. It seemed like a good time to try out a quick run on Thanksgiving morning before heading over to their house. My husband laughed at my logic that it was “only an extra 30 minutes” – when did I become that person? I found this particular race by looking at the calendars of a couple of local running stores, but you can use Google or the local running club to find events in your area or the area you are visiting. 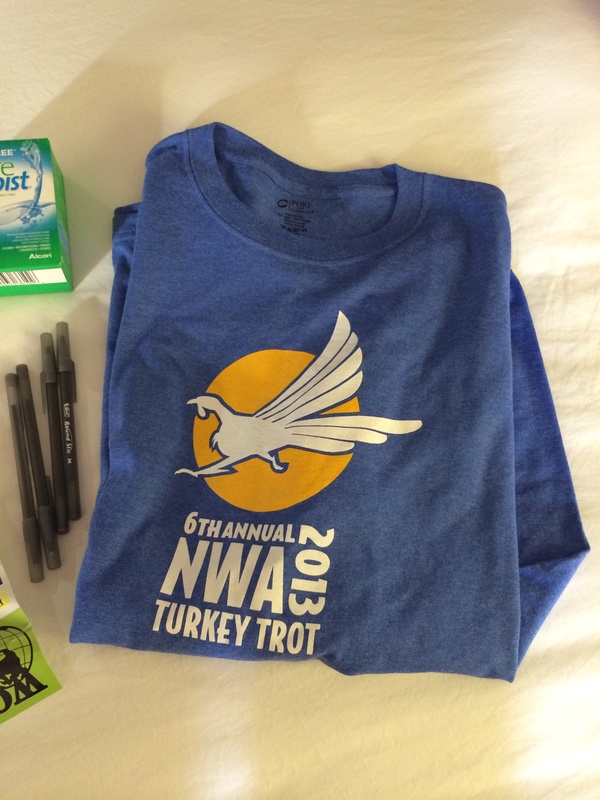 The NWA Turkey Trot is a merged event of two prior Thanksgiving fun runs, now benefiting both the Springdale Police Department’s Benevolent Fund as well as Sheep Dog Impact Assistance (the Facebook page is here, no dedicated website which is part of what made this hard to find!). In addition to the 5K, they also had a 1 mile walk and a Crossfit-styled 5K with the run and Crossfit workouts thrown in. I was interested only in the straight 5K – no need to go overboard! I’d hate to injure myself with the Crossfit stuff and miss Black Friday shopping! 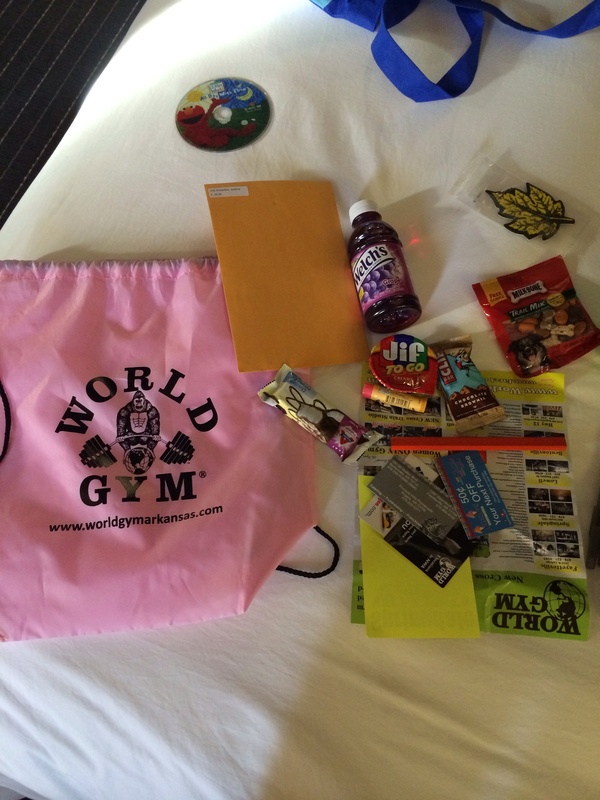 This race definitely wins the award for most eclectic swag bag in my book! Ten minutes after the traditional 5K started, they started the Crossfit 5K where people would do a round of workouts here, then run a mile and then do more workouts. My knees hurt just watching people jump up and down off of the those boxes and then head off running! The 5K was supposed to start at 8, but ended up starting closer to 8:15 because there was a problem with the timing system. While waiting around, I jogged a little to warm up and did lots of people watching. There were lots of track teams and lots of families with children. There were a few people out with their dogs too. I saw 5 turkey hats, 1 afro wig, 1 sparkle skirt and 1 guy in a chicken suit. 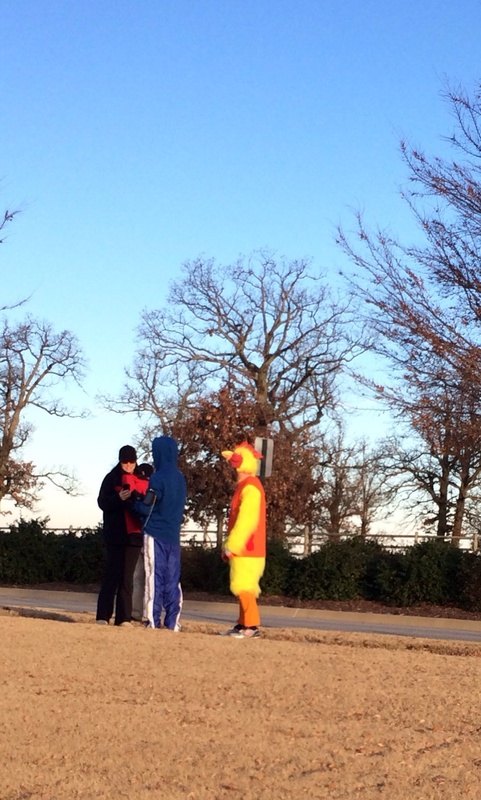 Spoiler alert: the guy in the chicken suit beat me in the race! The run finally got started and I started off way too fast! The starting corral was self-seeding and I spent the first quarter mile dodging around people, which lead to me running a lot faster than I intended! I finished the first mile in 9:03. At this point, I should explain that my only real goal for this run was to get out and run it. I wanted to join the ranks of people who thought going for a run on a day associated with eating tons of food was a good idea. I did check my 5K PR from the Midnight Run earlier this year (31:54) but wasn’t planning on pushing for anything. It was a paved round out in the countryside with no traffic and a lovely, cool, clear day to run. There were little rolling hills, but only one prolonged rise that felt difficult at all. I was feeling really good overall and after that first minute, realized I really could get another PR. In the second and third miles, I felt so worn out from going too fast at the beginning! I have really got to work on that. I finished mile 2 in 9:30 and ended up stopping to walk in mile 3 after reminding myself that I was out here to have fun, not to push for a PR. I was honestly pretty disgusted with myself though, for wearing out so quickly at the beginning. I walked about 30 seconds up the last big hill before the turn to the finish and decided to switch my Garmin over to show my total time rather than my pace. 27:40! That meant not only did I have a PR in the bag (I could see the finish line) but I could break 30 minutes for a 5K for the first time ever. My legs felt so tired but my spirit felt so good when I crossed that finish line at 29:40! Of course, I had my lovely cheering section at the end which was the icing on the cake. All in all, a great way to start Thanksgiving! I hope you all had a great holiday too! Not to suggest that any of this will include Black Friday information, but rather that you’ll be reading this while I’m either out shopping with my family or recovering from said shopping! Day after Thanksgiving shopping has always been as big a part of the Thanksgiving holiday celebration for my family as the turkey. After lunch on Thursday, we would all always sprawl across the living room with the various Black Friday to plan our attack. There was always one person who needed something that required an early morning line, but I think even if there hadn’t been someone who “needed” something like that, we’d find a reason to be in line anyway. It certainly makes for a day of good people watching most years (especially for me, as I’m usually done with most of my shopping by this point so I’m just along for the ride!). Last year was a little subdued because the mad rush for shopping had been the day before, with stores opening on Thursday. 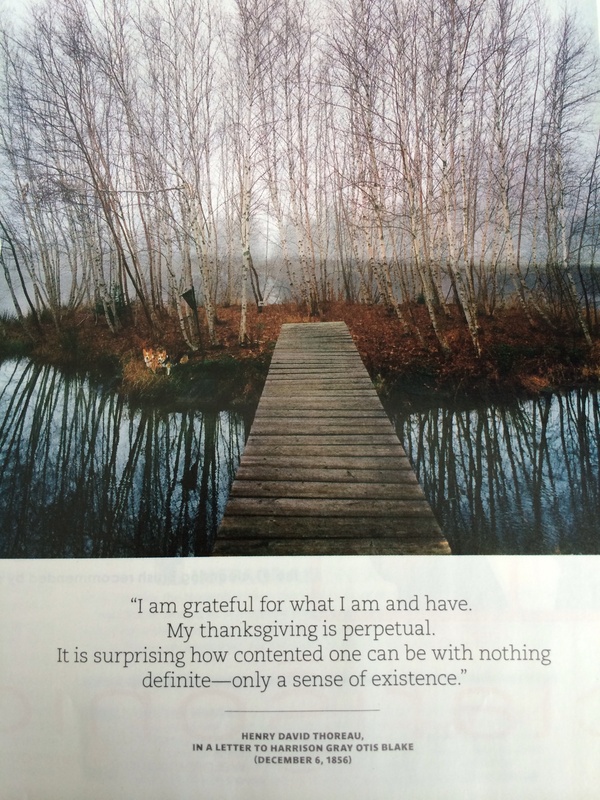 (I personally refuse to go on Thursday – nothing I need that badly and Thanksgiving deserves a day to itself). Regardless, all of the walking around to shop and look at Christmas lights will definitely count as my cross-training this week. Seems legit right? 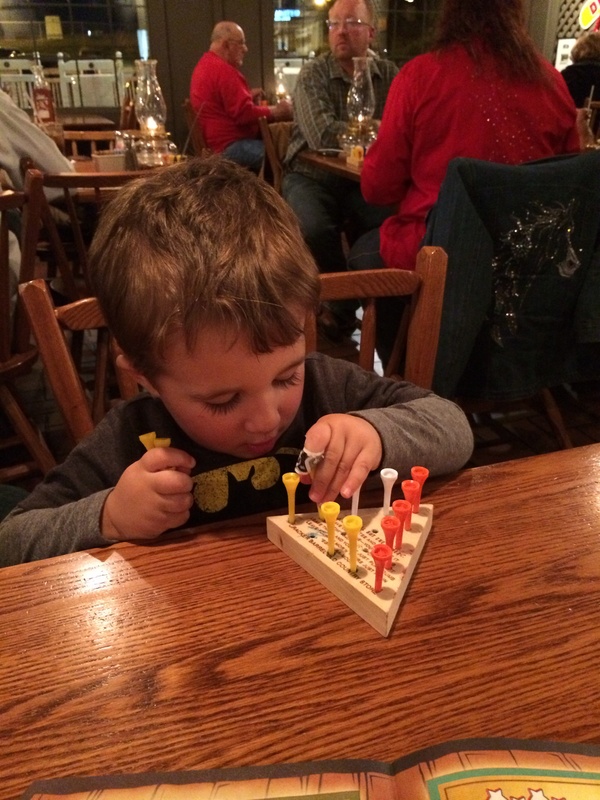 Cracker Barrel is always part of the Black Friday experience. On Saturday, Katie over at RunsforCookies wrote about a question she got from a reader about still feeling fat (check it out here). It has definitely been true for me that it has taken my brain a lot longer to catch up to the fact that I’m not a fat girl anymore than it did my body. It has gotten better with time, but I will probably always see myself as a former fat girl in my mind. It definitely helped me to come across people like Katie and others on the Weight Watchers 100 pounds to lose message boards who’d been through this kind of weight loss and understood how disconcerting it could be to have that kind of disconnect between your brain and body. That’s one of the reasons I think it is important that we tell our stories, so that others out there know they aren’t alone and that others have felt and thought the same weird things they are feeling. Speaking of changes in your body, I loved Desiree‘s picture post with the changes she’s experienced in the last year as a result of her exercise and diet changes (check it out here). A picture really is worth a thousand words! Way to go Desiree! Project Unfluff had a great post this week about Food Adultery: when your significant other “cheats” by going to a restaurant you’ve been wanting to visit together. It made me laugh because it is definitely something I understand (and my husband is smart enough to hide from me if he does this!) but also because it really does illustrate the huge status we give food in our lives. Should we feel so attached to certain foods that they invoke such feelings of violation? Probably not, but the only way we can work on the problem is to talk about it more openly and if we can laugh at ourselves along the way, that only makes it easier. In the spirit of yesterday’s gratitude post, check out the Another Mother Runner podcast this week where they discuss gratitude one unique way a mother runner has devised to help give back to the community. 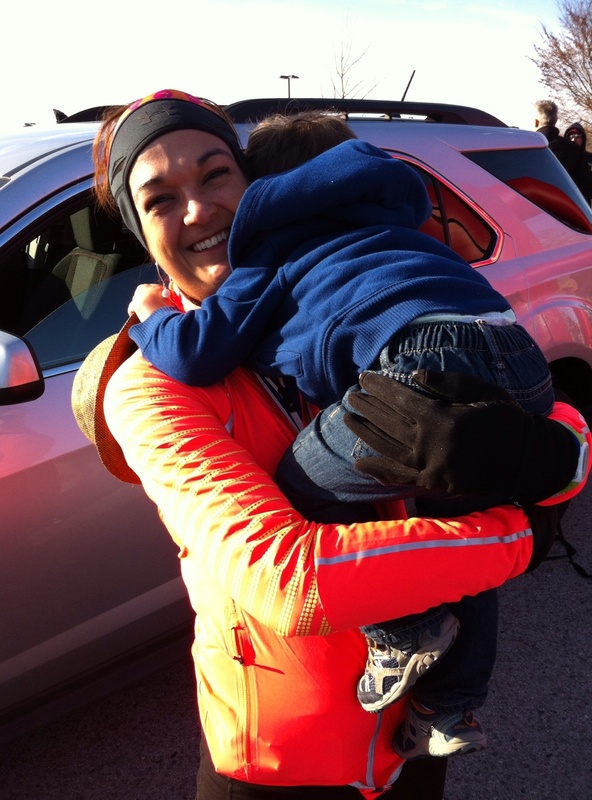 I really love the idea of a 5K with child care provided and getting to choose the charity for your contribution. This race also has a virtual option, which I’ll definitely look into! I love this post from Christine at We Run Disney about lessons learned from her first marathon experience. I was proud and tingly for her all over again (weird that I’m proud of a complete stranger? Maybe but the world of runners blogging, right?) and found this information so valuable as I am looking at my first half marathon. I have a feeling I’ll be re-reading this over and over as I get closer to the Princess Half Marathon. Thanks Christine! This is from a couple of weeks ago, but I somehow forgot to include it at the time time. Emily (over at FitandFreewithEmily) wrote a very thoughtful article about her experiences with Weight Watchers with a really balanced pro and con list of the experience. Weight Watchers has clearly worked for me (110 lbs down and holding! ), but it isn’t going to work for everybody and like Emily’s post highlights, it can really vary based on your meeting leader. You also need to be aware of what you can realistically expect, in terms of rate of weight loss and support for some more complicated issues like binge eating and other disorders. Going into it, I knew I had more emotional/binge eating issues that WW was going to be able to address. It is group weight loss support – there’s no way they can provide that kind of individualized support unless you luck into a great leader who can help you work on those outside of your meeting. For me, it provided valuable structure and was maintainable. It allowed me to stick with what I still think is the most important rule of weight loss: Don’t do anything to lose the weight that you are not willing to do for the rest of your life. That means, for me, no prepackaged foods, no shakes or supplements and no pills. I needed to learn to eat real food in the real world. While I love my WW leader, I have visited other meetings at the same location who had leaders that were everything you could hate about WW, including pushing the WW version of the packaged snacks and products and sticking to the rosy pre-fab WW script without delving deeper into the actual issues that get people overweight in the first place. If you’re thinking about Weight Watchers, I’d encourage you to read the blog entry and read all of the comments – the comments really highlight what a variable experience WW can be (and of course, you can always ask me anything). Lastly, as someone who gets frustrated trying to find the original reports in all of these articles talking about “new studies show . . .”, I loved this XKCD from this week entitled “New Study“. The science geek in me frequently links original source material, or at least provides the references, when I’m talking about specific studies because of just this issue! Enjoy the rest of your holiday weekend and happy shopping if you’re out there! Be kind, be polite and remember that the holidays really are supposed to fun! In reading for tips for staying motivated through long races, I ran across the idea of dedicating each mile to a different person in your life. I like the idea of taking a deliberate moment to reflect on the people and things for which you are grateful, especially as there are so many things and people that frequently go into getting you across the starting and finish lines of a race. In honor of my upcoming half marathon and this day on which we are all supposed to take a moment to express our gratitude, here are 13 things for which I am grateful. 1. My health: There is not a morning that I wake up that I do not think about how grateful I am not to take blood pressure pills anymore. I started medication for my blood pressure when I was 29 and weighed 280+ lbs. It took two medications to get it under control and I stayed on those medications for 5 years, including through my pregnancy. My blood pressure meant that I needed extra monitoring during my pregnancy and I struggled with feelings of guilt over putting my baby at risk, both from my blood pressure and from the medication, throughout my pregnancy and even after he was born and I was breastfeeding while on medication. Since January 2013, I have had normal blood pressure without any medication and I am more grateful for this than words can express. 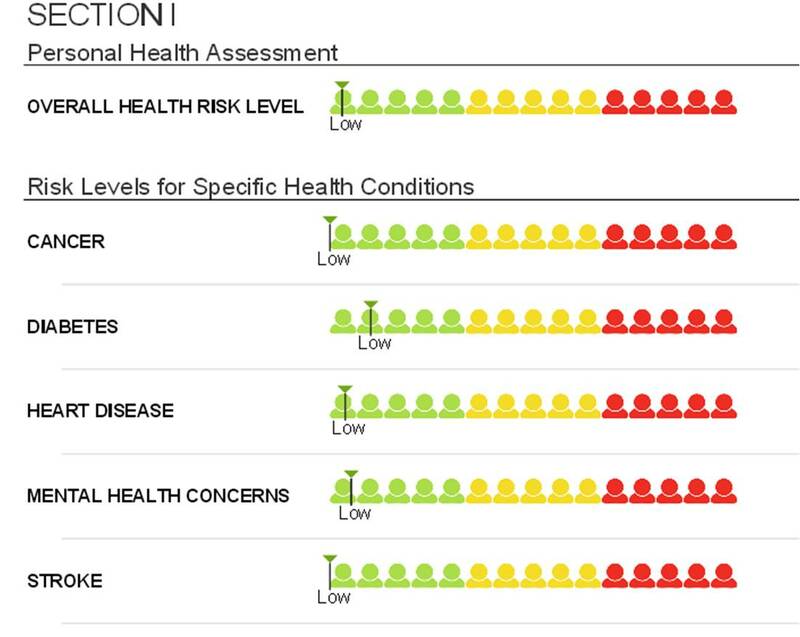 With my history of gestational diabetes and obesity and family history of diabetes, I know I’m still at risk for diabetes but at least I am now actively taking part in managing my health risks. 2. My husband: He should really be at the top of this list and of every list about the wonderful things in my life. He is good, honest, supportive, smart, funny, a great dad and the best partner a girl could want. I could not have made the changes I’ve made in the last 18 months without his unwavering support and faith in me. 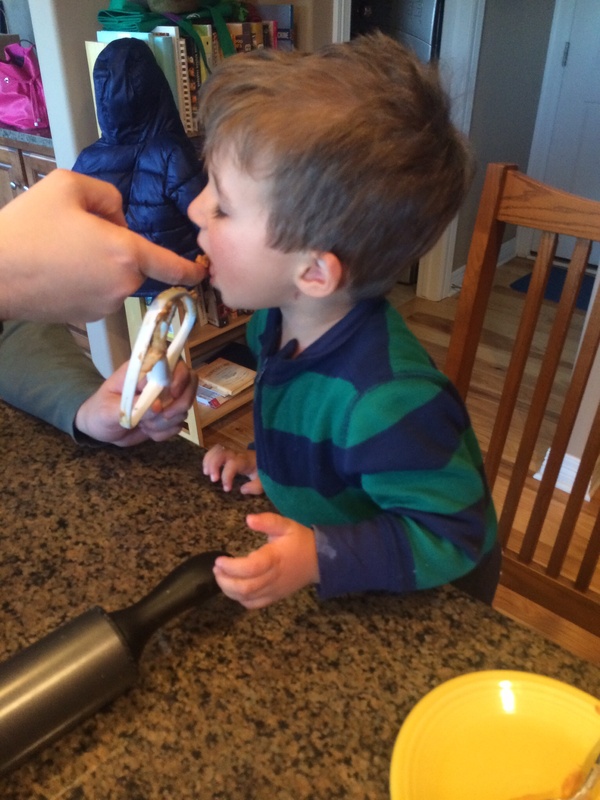 He has rolled with the changes in our family meals without (much) complaint – especially important since one of his favorite things about me was my great, but not very healthy, cooking. He has woken up early to take on toddler duty so I could go to early Weight Watchers meetings or go for runs. He has never asked how much I spent on the drawers full of running gear I now have. Most importantly, though, even when I couldn’t believe in myself, he has always believed in me. 3. My son: I find the joy and wonder that O experiences in the most mundane experiences to be incredibly inspiring. We all should look at the world through two year old eyes more often! 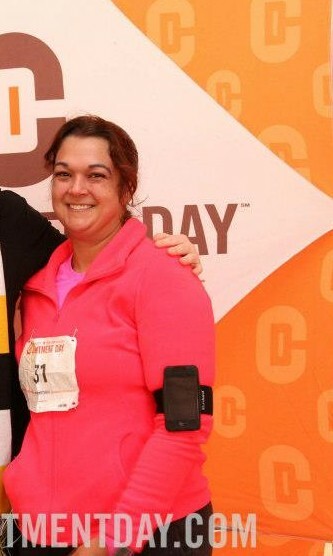 I also love that when he sees a picture of runner, he asks if it is a picture of mommy. 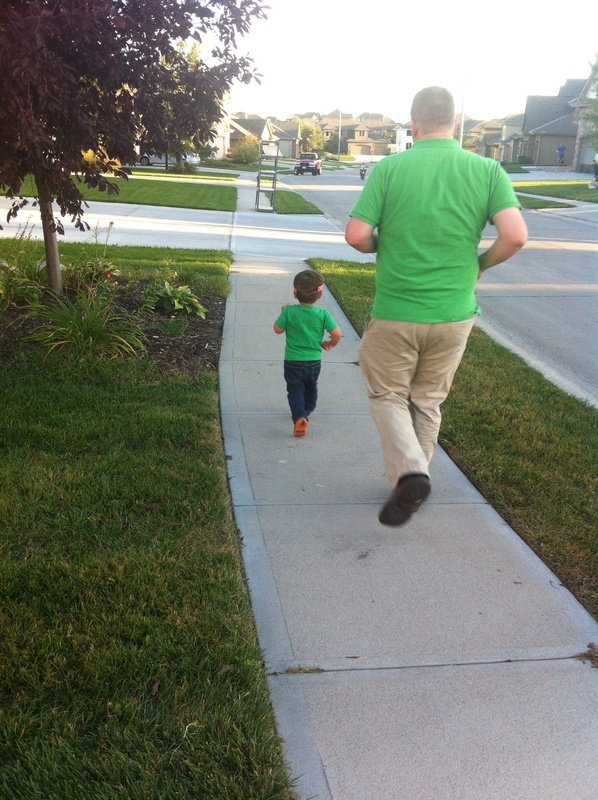 It is so motivating for me to know that my son sees me that way. I am very blessed to be his mama. 4. My education: I have always loved school and the process of learning and now I’m very grateful for the opportunities I’ve had because of my education. Yes, I worked for it, but I also know that I’m privileged to have it. My favorite part of my day job is teaching others and particularly, teaching them how to be lifelong learners. 6. My job: My job is challenging and rewarding and I get to work with fantastic people who really are trying to make the world a better place. My job also provides flexibility and funding for my running habit and allows me to travel to places this small town girl never imagine visiting. 7. My parents: My parents raised three children with the drive and ambition to leave the small town we’re all from and go out into the wider world. They also showed us every day what marriage could be, still partners and best friends after almost 40 years of marriage. It gave all us very high standards in a partner and that is priceless. 8. Running: Running has given me a self-confidence I’ve never experienced from anything else. By traditional society standards, I’m a very successful person but I’ve always had a bit of that “fraud” feeling, like someone is going to figure out any day that I’m not as smart or as talented as they think I am. With running, I don’t have those thoughts anymore. I do it for me and it doesn’t really matter what anyone else thinks. In my mind (and in my 2 year old’s mind), I am Superwoman. 9. Coffee: No one said these had to be heavy, weighty concerns, right? 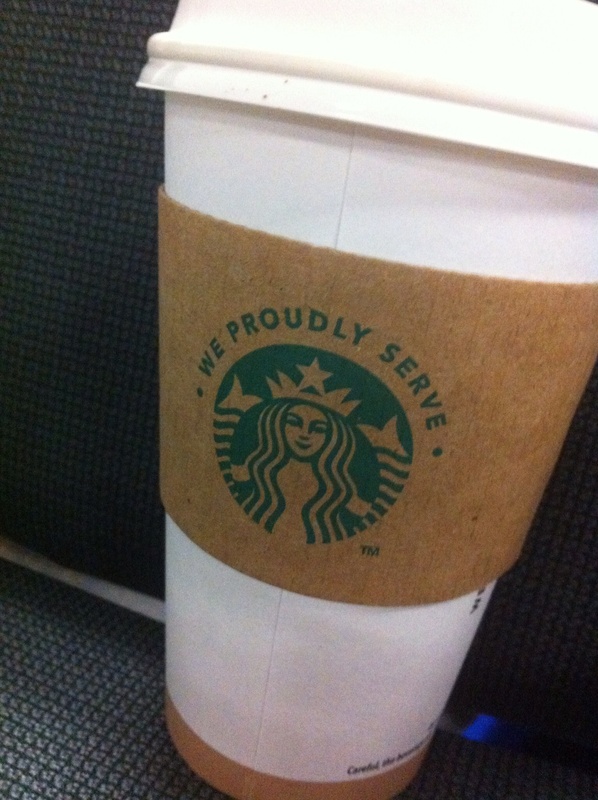 I am so grateful for the Keurig that greets me every morning and for Starbucks. 10. My smartphone: I seriously cannot imagine life without instant access to the world in the palm of my hand. My smartphone lets me take pictures, listen to music, connect to friends all over the country and track my food and workouts. I love being able to pull up a video to entertain my kid or look up a random factoid that came up in conversation or find the menu of the restaurant we’re planning on visiting next, all with a few finger taps. 11. My friends: I am fortunate to know some smart and fantastic women (and a few men) who have been friends no matter where our job and families take us. There’s always some out there who gets me and that is pretty awesome. 12. Zero point fruits & veggies: The sneakiest part of Weight Watchers are the zero point fruits and veggies because they have sucked me into learning to love all kinds of new fruits and veggies just so I can fill me need to eat tons and tons of food! 13. My sense of humor: My ability to laugh at the world and at myself are invaluable. I’m like everyone else – there are days I feel like a failure at work, as a mom, as a wife, as a runner, as a Weight Watcher, as a human being and yet most days, I can find something to laugh about (like this and this and countless others I don’t tell you about). This skill (thanks Mom & Dad) makes life immeasurably easier. 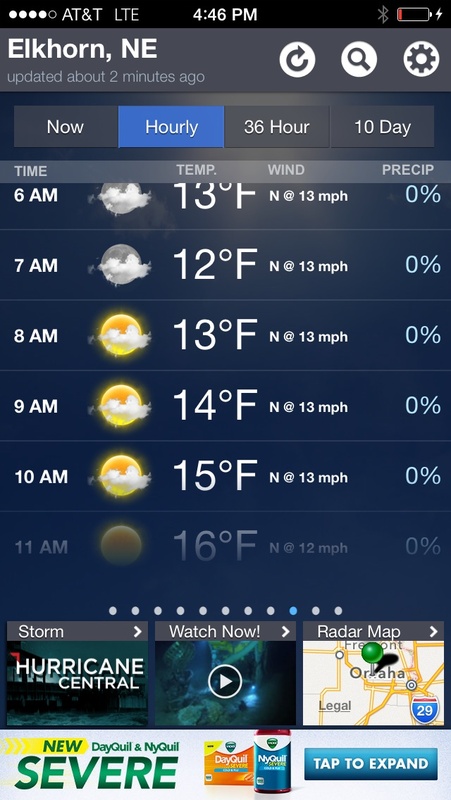 And for the extra 0.1, I’m grateful for that I can listen to Christmas music tomorrow without fear of judgement! Happy Thanksgiving to you all! I’m grateful for this outlet and for all of you I’ve gotten to meet virtually. Seriously, this is just a day. Try not to give it and the associated foods the power to send you into a spiral of guilt and shame after it is all over. If you remember nothing else I say today, remember that. This is a day that can be particularly challenging because there is a lot of emotional investment in the foods that are served, from years of memories good and bad that we associate with this day. It can also be challenging because unless you’re hosting, you don’t have much control over the foods you are going to be served. Even if you are hosting, with all of the foods that your particular family traditions require, you may not have much control even though you’re providing the food! It can also be stressful, which leads to overeating for lots of us. It’s completely human to be worried about Thanksgiving if you’re trying to lose weight! Remember that it is a day about more than just food. Focus on crafts with the kids or catching up with your family or reflecting on the things for which you are grateful and try to take some of the focus off of the food in your mind. I know as a mom of a two year old, I’d be thrilled if someone volunteered for toddler entertainment duty and it would definitely keep you too busy to graze! Speaking of grazing, be careful about the nibbles before and after the meal. It’s easy to eat tons of calories without realizing it while you’re cooking and cleaning up. One tip I heard that would be helpful is to use a different spoon for each taste and keep them lined up on the counter so you can see how many bites you’re taking. That could add up fast! Look over all of the food options before you decide what to choose, so that you can make balanced choices. If you know you want a piece of pumpkin pie with whipped cream, maybe you take a little less stuffing to make room in your calorie budget. This even helps you plan appropriate space on your physical plate! Many times I’ve grabbed things as I went along, only to run out of room on my plate before I get to the item I was most looking forward to. This means I either literally pile my plate or worse, I may a second trip which tempts me yet again with all of the other items available. Try to make one trip and make it one where you’ve planned your choices beforehand. Choose the things that are worth it. Generic grocery store cake probably isn’t worth it but your grandmother’s famous stuffing may be. Choose things that have the highest rewards in either taste, emotional impact or scarcity (ie don’t pick something you could have any day of the year!). For me, the roast turkey is really the thing that is worth it for me – I’ll be using most of my points there for the day! Wait at least twenty minutes after you’ve finished eating before you consider going back for dessert or going back for more. That gives your stomach time to process that you’re full (or that you’re not!) rather than rushing through while you’re on a roll. It might help to get up and take a walk or at least leave the room to get your mind off of eating more if you aren’t really hungry. This is sort of obvious, but bring something you can eat a lot of (like a fruit plate, veggie tray or salad). Even if no one but you eats it (and even if you don’t actually eat it yourself), it helps you feel like you have a little smidgen of control over the food you are presented with. Most importantly, it is just one day. That means if you don’t stick to your plan, don’t beat yourself up so much that you ruin the rest of your weekend. One day of overindulgence is not going to undo all of the work you’ve done unless you let it bleed into the rest of the holiday season. If you break one egg, you do not throw out the whole dozen! Friday is just another day – get back on track! Lots of us are hitting the road for the holidays. First and foremost, drive safely! In the spirit of prior travel-related posts (food and workouts on the road), I thought road trips deserved their own discussion since they can be a little different than air travel, in good and bad ways. The nice thing about a road trip is that you have more options as far as food to bring along or stop for and when and where you take a break to move around. My favorite thing about traveling by car as opposed to traveling by plane is the ability to bring more stuff (and I don’t just mean that because I’m an overpacker!). You can bring whatever workout gear you’ll need for your destination, so long as fits in your car, like weights or shoes or your bike. You can also bring a cooler complete with snacks and any particular foods you need when you arrive. That takes the idea of wandering around on foot trying to find fresh fruit near your hotel out of the picture, which is really nice. 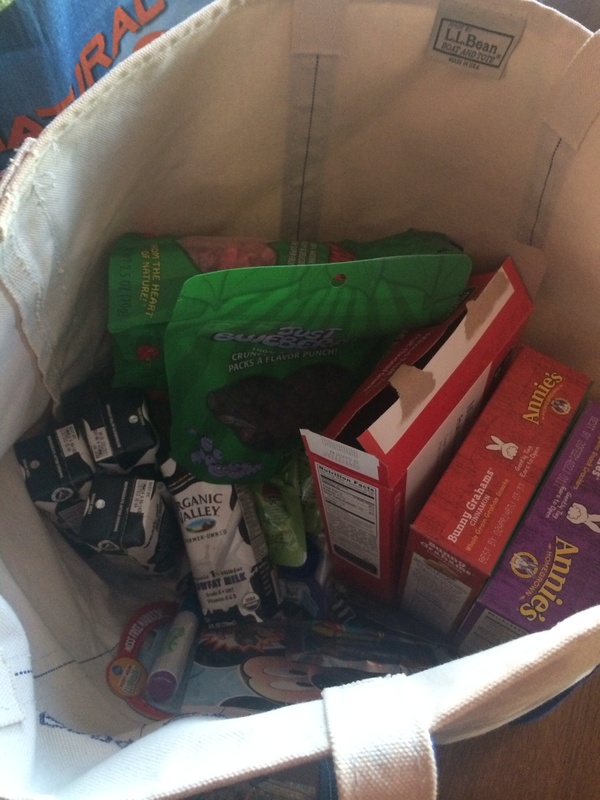 We’ll be bringing a cooler as well as a bag with snacks for the road and planning to stop at a grocery store when we arrive, which will make things a lot easier. Confession: I removed my husband’s chocolate covered donuts from the top of the bag before taking this pic. Bottled water / healthy beverage of choice (we always have the little UHT milk boxes). Fresh fruit: Grapes, apple slices travel well for snacking; bananas can also be good but you need somewhere to store the peels. 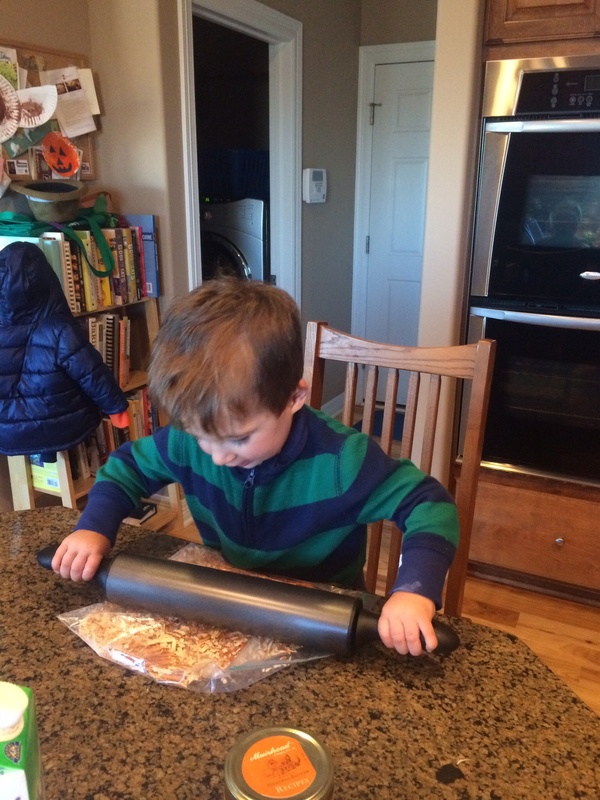 We also pack freeze dried fruit – my son loves the blueberries! Veggies: If you’re someone who likes to snack on raw veggies (confession: I am not! ), bring some along. Popcorn (popped, obvs), any other healthy salty snack: I like PopChips and the Kavli Rye crackers. Boom Chicka Pop is also great for pre-popped popcorn, especially the “slightly sweet” version. Nuts: A limited and pre-portioned amount, as nuts are undoubtedly good for you but very high in calories if you aren’t careful with the number of handfuls you’re grabbing! Anything that doesn’t require a dip or utensils will work (not that you couldn’t also do dip / utensils as a passenger, but it could get tricky!). Just be sure you’ve pre-portioned it so you don’t grab more than you intend to while you’re distracted by the road and be sure you have a plan for containing the garbage in the car. I also make myself a lunch, just like I do for a regular workday, with a sandwich, chips/crackers, fruit and a drink, so that I don’t have to settle whatever fast food option we’re passing at the time. If you can, try to time your breaks for meals near a bigger city so that you have more options. In a lot of small towns we drive through on the way to Arkansas, McDonalds is the only option so your healthy dining choices are going to be restricted. In case you forget your lunch or don’t pack one (or eat it an hour into your trip, well ahead of lunch time – not that I’ve ever done that), go ahead and look at a couple of fast food menus and decide what you would order if that’s where you end up eating. Just being prepared ahead of time helps you feel more empowered and less tempted to go off the rails when you’re faced with that menu and drive through. My fall back option is usually a kids meal, FYI. Just try not to think about the fact that the kids meals contain what is actually a more appropriate number of calories for an adult meal – it gets depressing fast! Also plan on having something to distract you along the way so you can avoid the mindless eating, like a new audiobook or new music or a traveling companion who promises to help you stay on track! Plan for real food at least one meal of the day, even if that means taking a little extra time to stop and find a restaurant where you can actually sit down with real utensils and real vegetables at some point during the day for really long trips. For us, we’ll be able to do breakfast and dinner as real food so that should help. 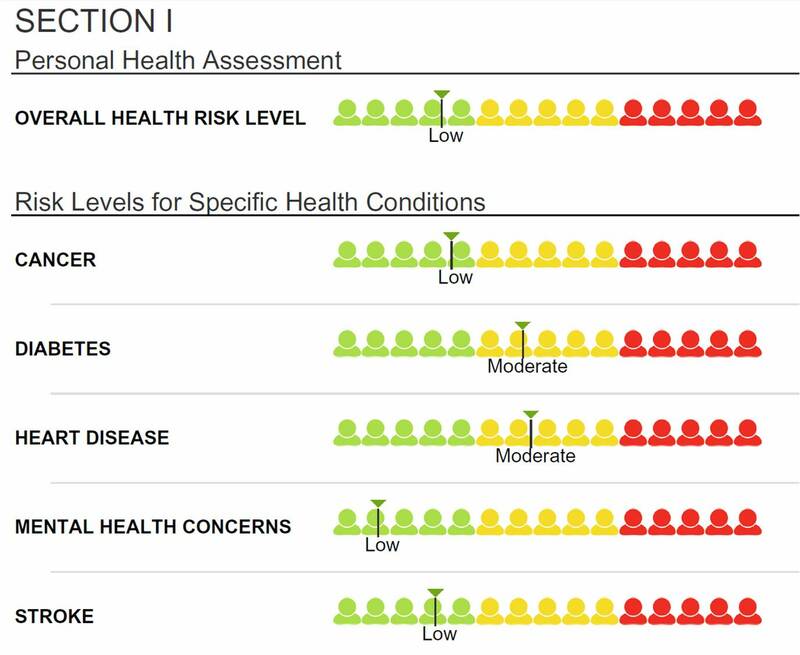 As far as activity goes, this is the real disadvantage as compared to air travel because you really can’t get up and walk around in the car (unless you’re in an RV I guess and then you should still limit it for safety!). You can definitely still try to move your legs around and do all of the things you’re supposed to do on a plane to avoid blood clots (check out info from the CDC here and Hematology.org here). I would also recommend getting up to walk around any time you’re at a gas station or stopped for lunch or potty breaks. Secure your car (and be someone is supervising your kids/pets) and take a quick walk, even just around the store or the parking lot. Any movement helps and can add up over the course of the day. Given my little goal of running in all 50 states and the fact that we drive through several states on the way to Arkansas, I may be hopping out of the car to run a quick half mile in Missouri while my husband pumps gas and supervises two year old potty breaks. We’ll see – I’d feel a little silly, but it would help me get some activity in for the day. If you have a work out on your training plan that needs to be completed on a day you’re road tripping, I would really try to get it done before you hit the road. It’s a lot less stressful than worrying about having to get to your destination in time to finish your workout and after being in the car for several hours, you may be too stiff to get in a quality workout. A little walk or run after you hit your destination would feel really good, but you may not be capable of the intensity / form you’d really like, so think about that in your planning. Travel safe this week! Pay attention to the roads even if you aren’t traveling – lots of people driving your streets are visitors and aren’t going to know where they’re going. Be patient, be kind and be careful! This year, I’m going to be participating in my very first Turkey Trot! Even before I was a runner, I was always tempted by the idea of the runs on Thanksgiving morning because it seemed like something average people participated in, not just the uber-athlete. I love the idea of holiday-themed runs to help keep healthy habits in our minds in a season where we’re bombarded with indulgences! It’s all about balance right? *As a side note, I am really bemused by the email I just got from my gym with the holiday schedule for Thanksgiving, where there will be fitness classes from 6 – 11am (I really hope those instructors volunteered for that – no one should work on Thanksgiving against their will!) but things are completely closed Black Friday. Apparently shopping trumps family food time, although knowing my gym’s clientele they probably had members insisting on classes before they went to Thanksgiving dinner! My very first 5K was on New Year’s Day last year (Commitment Day) and while it was very light on theming (really no theming at all), it was fun to start the New Year on such a symbolically healthy note with lots of others who were doing the same. Looking back, I remember being so impressed with another woman I talked to on the bus over who was looking at doing a half marathon sometime during the year and being so amazed at the idea of running that far. I never expected to be training for my own half marathon less than a year later! Throughout the holiday season, themed runs abound and what I love is that these are largely “runs” – not races. Most of them are very low key and (hopefully!) less intimidating for new or casual runners. They’re also frequently fundraisers for community outreach projects like the Food Bank, Toys for Tots and various shelters. Not only can you burn off the calories for the pie you’re going have later in the day, you can do your good deed for the day. Definitely a win-win! Because these events are so low key, they’re also a great way to introduce less athletic family members to the idea of exercise and physical activity for fun. Whether they are spectators or participants, I think it helps to introduce the idea that the holidays are about more than food without being preachy about it. The events I’ve read about and seen really seem like giant holiday parties where people happen to cover a few miles. Most of these events welcome costumes and strollers. Some even welcome your dogs, which would be an adventure in our house with one very inquisitive terrier and one very lazy lab. I’ve even heard of some families that do their own unofficial holiday runs each year on Thanksgiving or Christmas, which sounds fun! Aside from the fun of holiday runs and the extra room in your daily calories it allows you for holiday treats, holiday-themed runs are also a good way to help keep you accountable to your training plan or maintaining your level of fitness during the chaotic holiday season (how many times can I put holiday in a sentence?). I know for me, the idea of that 5K on New Year’s Day is the only thing that kept me running last December. Otherwise, I’d have spent my time shopping and celebrating rather than braving the cold and snowy streets! If you’re traveling for the holiday, look into the running club in the area you’ll be visiting or local running stores to get information about any holiday themed events that may be occurring. This is especially helpful if you’re in a smaller town where it is more likely to be a locally organized run rather than part of a national series that has its own web presence. I found the Turkey Trot I’ll be doing in Arkansas through the calendar on the local running store’s website after not finding anything on the national race calendar sites. In Omaha, the Omaha Running Club has a calendar of events that includes lots of small local options as well. Do you do any holiday runs? Is it an organized event or a tradition of your own? Anybody have an ugly sweater to lend me? It is very nice to see those numbers come down! I know the changes I’ve made are good for my health and not just my clothing sizes, but it is nice to see it spelled out too. 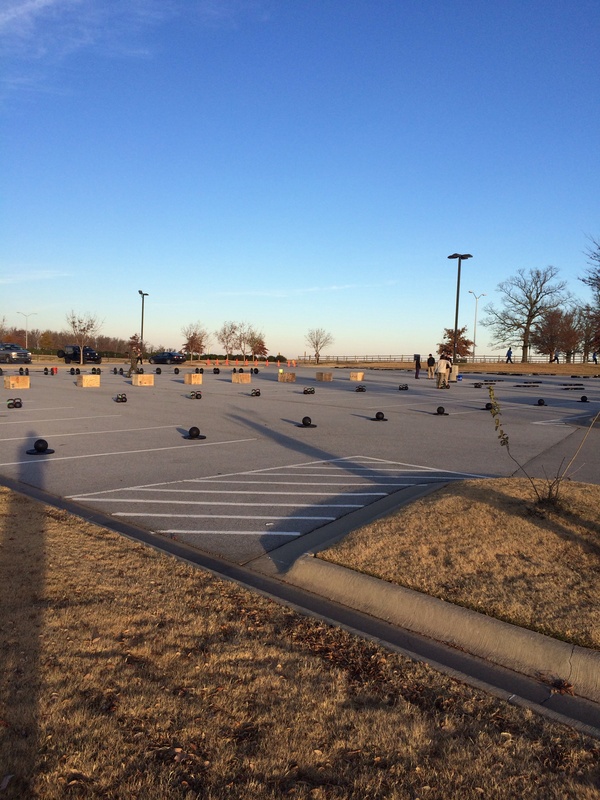 This week’s workouts were carefully planned around lots of before/after work activities and setting things up for workouts the week of Thanksgiving. Next week’s long run is 6 miles and I’m planning on doing it Monday or Tuesday so that I don’t have to find time to squeeze it in with travel and family time over the holidays, so that meant avoiding a big run this week on Sunday (big runs two days in a row isn’t a deal breaker, but it isn’t fun either!). 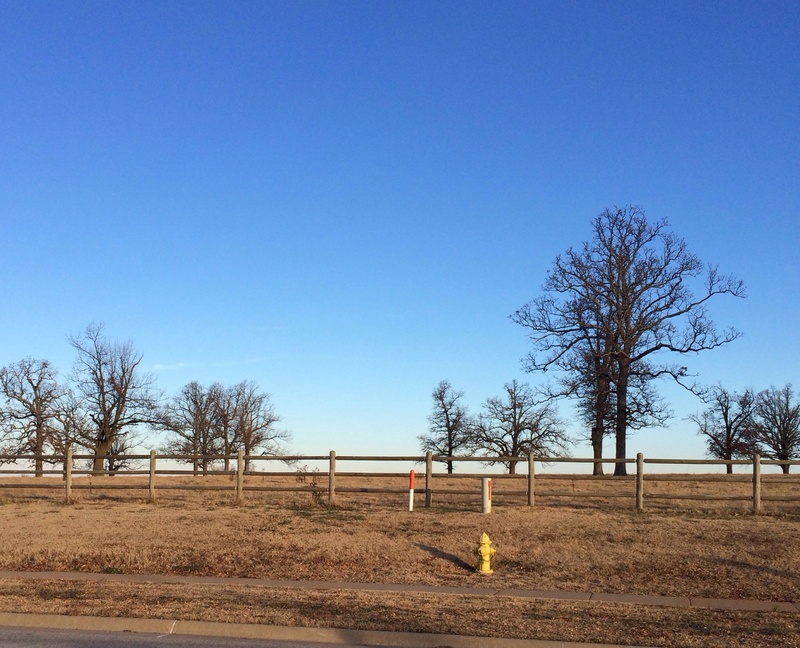 Monday – 4 miles in the early morning. I only planned on 2 miles this morning since I had run on Sunday, but it felt so good to be out there and going that I decided to go ahead and do 3 and then found myself doing all 4! Nice to get one of the bigger runs for the week marked off my list so early in the week – it makes me feel like I have more breathing room in my week. 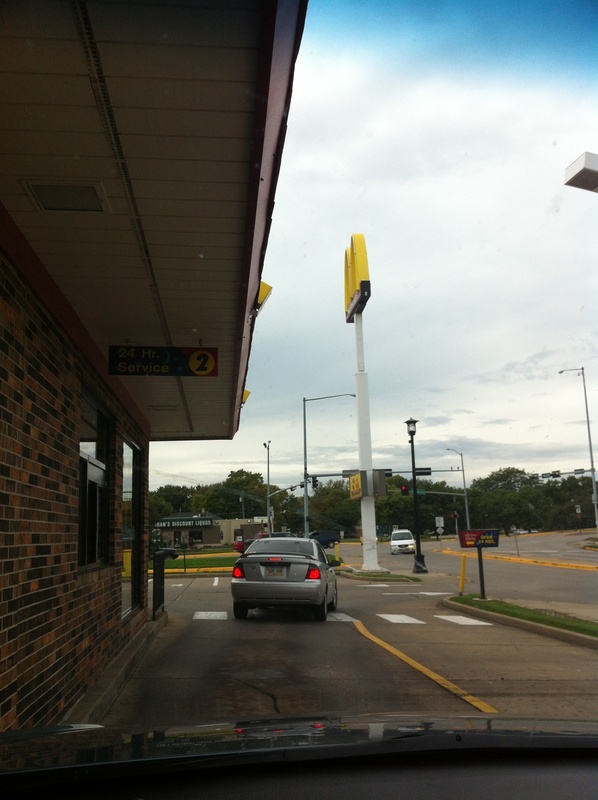 Wednesday – 25 minutes walking between car dealership & mall while waiting to get my oil changed. I intended to get in another 20 minutes later to make this my cross training day, but that never happened so this was just a little bonus workout. Friday – Snow shoveling! Otherwise, a rest day. Saturday – 2.5 miles outside before I went to Weight Watchers and then 1.5 miles on the treadmill at the gym to finish my 4 miles for the day (and my 13.1 miles for the week for my Doctor Who virtual half marathon). I try not to split runs up like this too often because learning to stick with the long run is important mentally as much as physically, but I just woke up at a weird time so this is what worked. It was super cold (according to my Weather Channel app 11 degrees and felt like 5 with the wind chill) but with lots of layers I was okay other than my hands. 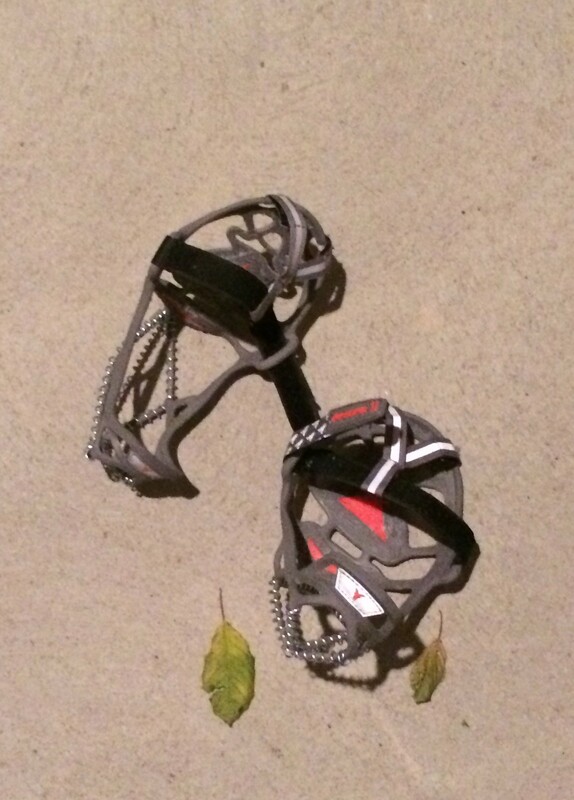 I did try out my YakTrax, which are a web of springs and spikes that fit over your normal running shoes to make it easier to run on snow and ice. Once I got used to the feeling of an extra layer under my feet (which felt odd but not unstable on non-icy road), they did help me feel more secure on the snowy/icy patches. I still tried to avoid any big patches of ice but those made it easier to cross the smaller areas without seriously changing course. I added a page with my current training plan to the blog. I’m using a hybrid of the Higdon/Galloway plan after reading up on several different training plans (see my thought process here). We’ll see how it goes. So far, I feel strong and am getting faster, so I think it is going great! I definitely don’t want to push too hard and get injured. I’d rather undertrain a little than overtrain. I know I could walk and finish if I don’t get hurt and finishing safely is much more important than being able to run the whole thing (although I hope and expect that I will be running it!). In no way do I recommend this for anyone else as I am not a fitness professional – this is just what is working for me after lots of reading and looking at my particular schedule. 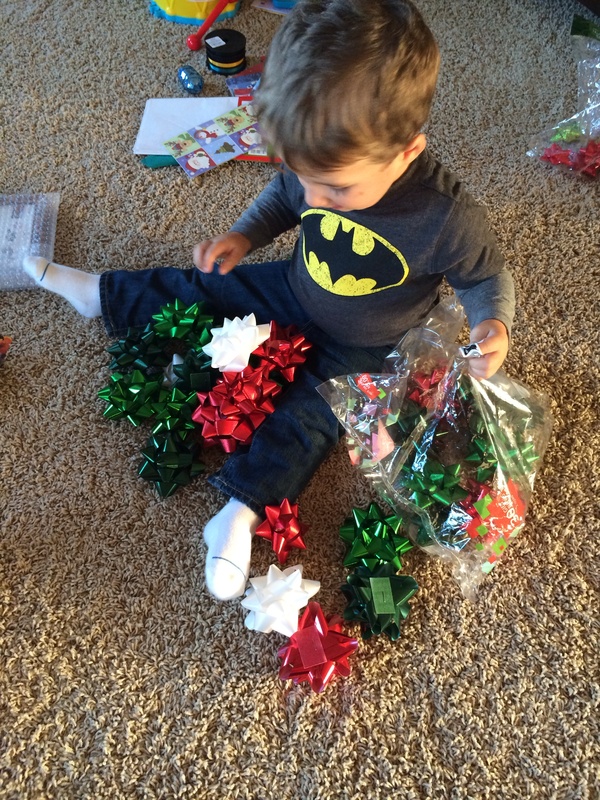 Publicly sharing this should help me stay on track through the busy holiday season. I forgot to include in Monday’s post (Am I the only one?) this particular quirk: Am I the only one who has to look up their Twitter name anytime someone asks? Because it is saved in my phone, I don’t ever think about what my name actually is! When someone asks, I have to go look it up. I am so great at managing my social media presence, right? 😛 (99% sure at this moment that I’m @Jessa_Snow but I should probably check that!). 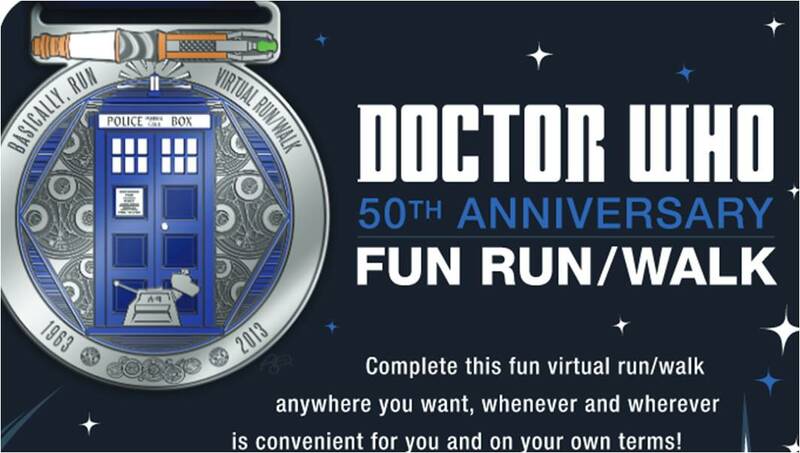 Today, I am finishing up my fourth virtual race with the Doctor Who 50th Anniversary Virtual Fun Run/Walk, so I thought it would be a good time to talk about virtual races. Before I started running, I didn’t even realize these existed! Virtual races are races that organized online (usually, although I guess it wouldn’t have to be) in which you run on your own, wherever and generally whenever you like. You can run outdoors or on the treadmill. There is no minimum pace, so you can walk as much as need to without fear of the “sweepers.” While there is usually a recommended time frame for completing the event, this time frame may be an entire week or even a month. Regardless, if you don’t want to get up for a 5:30 am start (already dreading that part of PHM! ), you probably won’t have to. Virtual races are frequently done for fundraising, in which your registration fee / donation goes to good cause. With virtual races, because they require less infrastructure on the part of the organizers, you can find a much wider variety of causes and themes than you might in a traditional road race. I’ve run across lots of virtual races that have been organized by individuals for their favorite causes or even to help meeting their fundraising goal for a charity-sponsored admission to another race. With these races, you might get a t-shirt or a medal or other momento of the event. Women’s Health sponsored the Run10Feed10 event earlier this year, which paired races in several cities with the option to run the race virtually on your own if you didn’t live near one of the host cities, which was a nice idea. For that run, we got a bag filled with samples from some of the events other sponsors and I completed it over the Golden Gate Bridge in San Francisco. I ran parts of the same course that the official race would cover a few weeks later, which was fun and the registration fee went to support hunger relief programs. Not all virtual races have registration fees. SparkPeople has an entire page devoted to virtual races without associated fees. These allow you the opportunity to participate in a group running event even if you live in a more remote area or you can’t afford traditional race registration at the time. They post the times of others competing in the virtual race so that you can see where you would rank and how you progress over time. You can even break it up to run in segments, like I did with my half marathon this week. My training plan called for 13 miles total this week, so I get to complete the virtual half marathon for the Doctor while still saving my first complete half marathon for Disney in February. You might get some fun bling (really looking forward to my Dr. Who medal). You can contribute funds to a good cause and get a good workout in – always love double dipping. You can still participate in a race even though you live in an area that doesn’t have many organized running events. You can participate with friends that may be geographically too far apart to otherwise run together. If you’re someone who gets stressed about the pressure of “race day” this might be a lower pressure way to assess your progress. No “sweepers” or minimum pace to meet. With many virtual runs, there’s a lot of social support via message boards, websites, Facebook, etc where you can find others to cheer you on. Many sites even encourage you to submit your race photos to share! 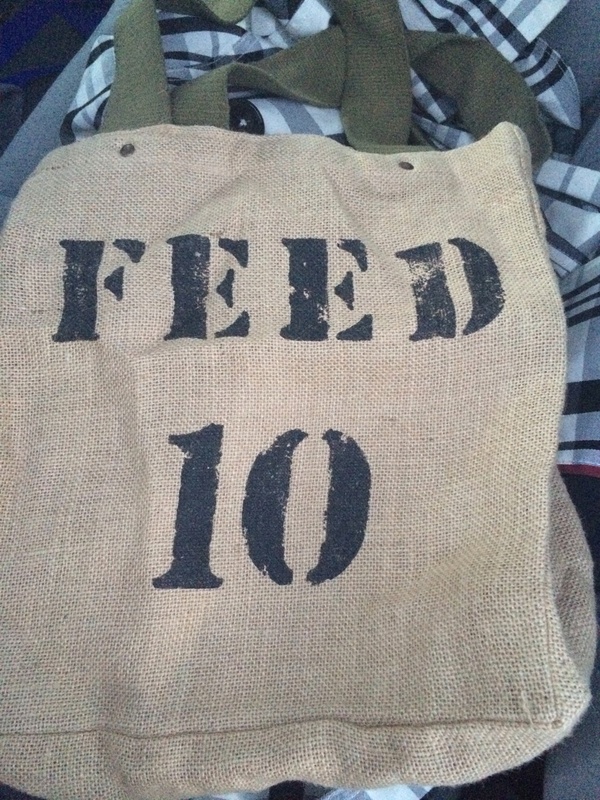 Some will send you a bib or link to print your own bib if you’d like. Virtual races have some of the most interesting theming! Jost’s Slow Your Roll for November (in which you are actually encouraged to go slower than normal, not faster), the Nerd Herd’s Star Wars, Harry Potter and Banned Book series (really hope they do that next year) and of course today’s Doctor Who run are just a few examples. You can easily organize your own virtual race, either for fun (like Katie over at RunsforCookies did for her 31st birthday via her blog) or as your own fundraising event. You miss on the extra push you get from spectators and other runners, which might be a big deal for you. If you need a certified time for corral placement or to qualify for another event, this probably won’t count. You need to be mentally okay with the fact that some people are going to sign up for the race but never actually run it. One could easily lie about doing the run and still get the bling if the registration fee was paid. Where’s the fun that? Have you done any virtual races? I continue to enjoy reading all of the Wine and Dine Recaps! I’m particularly enjoying Meg’s over at Runaway Royalty. 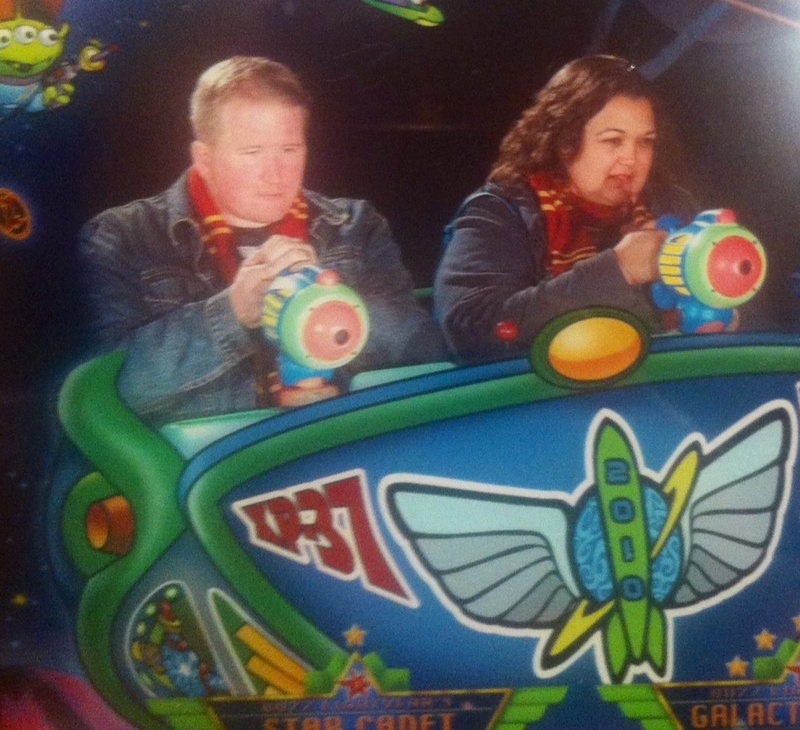 With all of the pictures, it feels a little like getting my own little Disney vacation in while I’m reading them. Thanks for sharing Meg! If I could be sure the Osbourne Lights would still be there (keep hearing rumors they’re leaving!) I would definitely sign up for Wine & Dine next year. Running through 3 parks just sounds amazing! I’m already trying to convince my husband to start running so we could do it together. 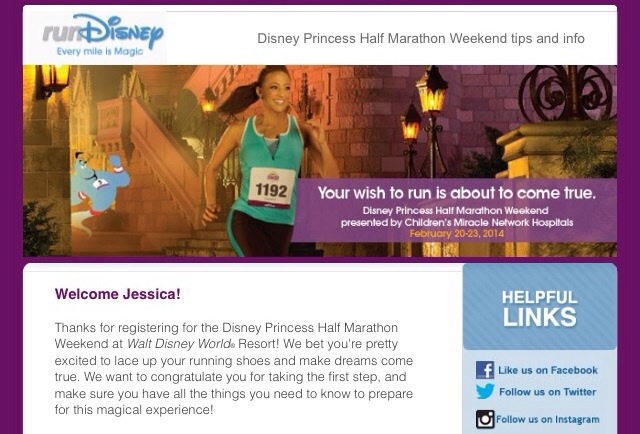 I will admit that I squealed a little at my desk yesterday when I got a “Preparing for your Princess Half Marathon” email from RunDisney!! Lauren over at Lauren’s Glass Slipper had a funny and fantastic post about running with long hair and her Princess Jasmine-style solution to it this week. While my hair isn’t super long now, I’ve definitely experienced the long tangled ponytail myself when I was on the dance team in Texas in high school. Humidity + long hair + physical activity really don’t mix well! Any excuse for a princess hair style is a good one, right? Fellow mother runner Laura (Project Lovely Laura) was featured this week over on Runaway Bridal Planner. So much of her story had me nodding my head in agreement! Definitely check out the profile and Laura’s blog! 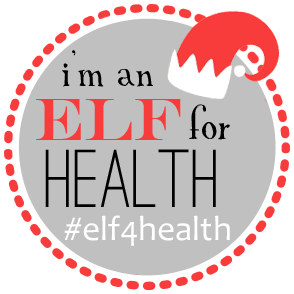 For the holiday season, I decided to join the Elf for Health challenge for 2013 via The Lean Green Bean. There are loads of weight loss challenges and fitness challenges that go on this time of year and I chose this one because it focuses more on overall healthy habits (including mentally healthy habits!) rather than weight loss. I love that the second day’s assignment is unsubscribing from email lists or catalogs – anybody that appreciates the importance of clearing “mental space” is my kind of person! 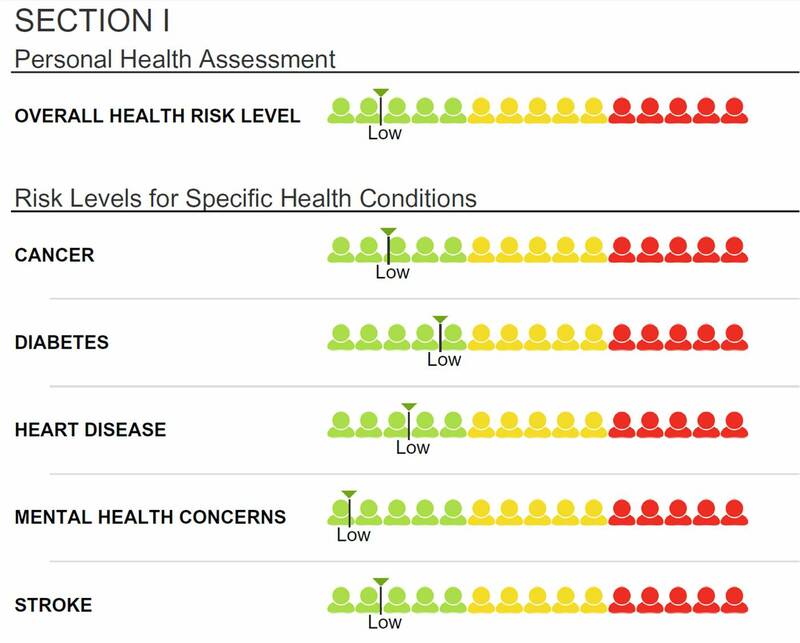 Are you doing any group health projects or “challenges” for the holiday season? Do you find them helpful to stay on track? With that in mind, I have a huge thank you for all of you guys! Yesterday was my 100th post! I am entertained that I marked such a momentous occasion with a tiny, slice of life kind of post but that’s really what I started this blog for – sharing the ups and downs while I learn to run and to maintain this healthy lifestyle, big and small. It helps me to talk about these things and meet others experiencing the same things and hopefully it offers a little help and entertainment to someone out there who needs it. Thanks to all of you for following along and sharing your wisdom! It’s been great meeting you all virtually! *As always, nothing sponsored in this post or endorsing any particular challenge. These are just the things I’m doing / interested in! 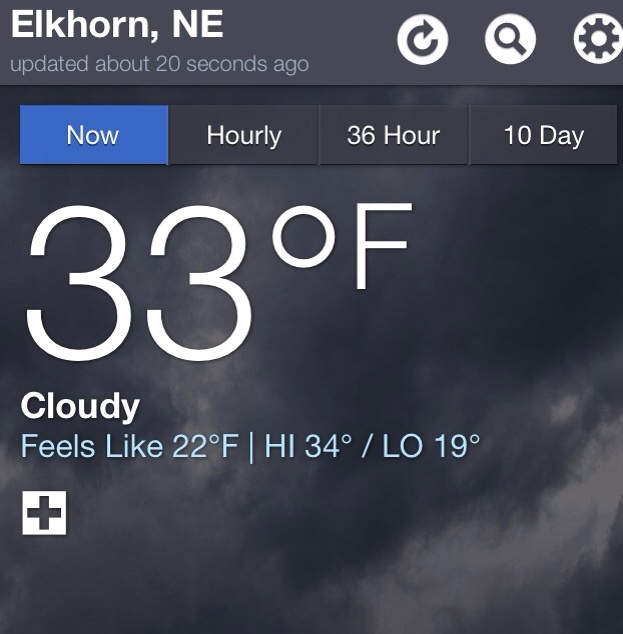 It definitely felt colder than 22 F with the wind blowing like it is. Very damp, very frigid and definitely bringing snow our way later today from the feel of things. It did give me a nice to chance to test out my winter layering, which worked well for the most part. My hands and feet were cold, but even they warmed up by the end. I think I’ll definitely be looking for warmer gloves though – it is going to get a lot colder and these just won’t cut it. I had my usual Old Navy pants on – nothing special for winter/lining – and my fleece lined tech top, fleece jacket and my reflective lightweight jacket on top (so I didn’t get run over). My trunk was warm and my legs warmed up quickly, so I think this layering will work out well. I may need to get warmer pants – I guess I’ll find that out Saturday when I have a 4 mile run on the schedule and the high that day is 22! I would definitely advise looking at the weather when you’re planning your workouts for the week so you don’t get caught off guard (any more than you have to anyway – weather is unpredictable). We have wintry mix/snow this evening and through tomorrow morning, so I knew I had to get this run in this morning. Tonight and tomorrow morning the roads may be too slick to be out, either to run or to drive to the gym. That meant waking up early today so I could get my run finished before my husband had to leave to go to the gym himself. He volunteered to skip it so I could sleep in a little but I made him go. What’s the point of me taking care of myself so I live a longer healthier life if he isn’t also taking care of himself so he can be there with me, right? Those of you who’ve met him know – I’m a lucky girl (sitting here at the computer eating fruit he so kindly washed and cut up for me because he knows washing the fruit makes my hands cold for hours!). I hope everyone up here in the Midwest stays warm & safe on the roads today! And I hope that we at least get snow that sticks out of this round – sticks out in the yard at least. 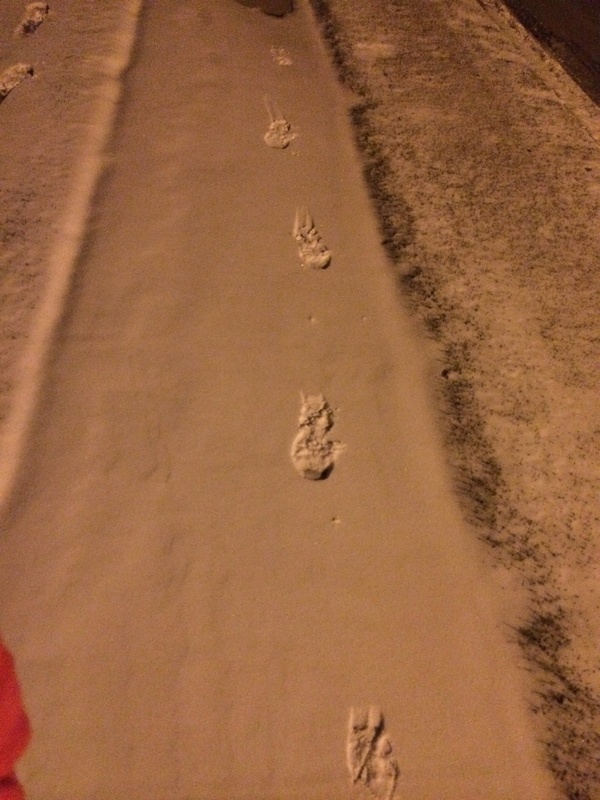 Wouldn’t it be nice if snow only stuck on the non-driving/running surfaces so we got to look at it and play in it but didn’t risk hurting ourselves in it?